Lead Climbing is often called Sport Climbing, when there is protection points permanently bolted into the wall which you attach to as you climb from the ground up. 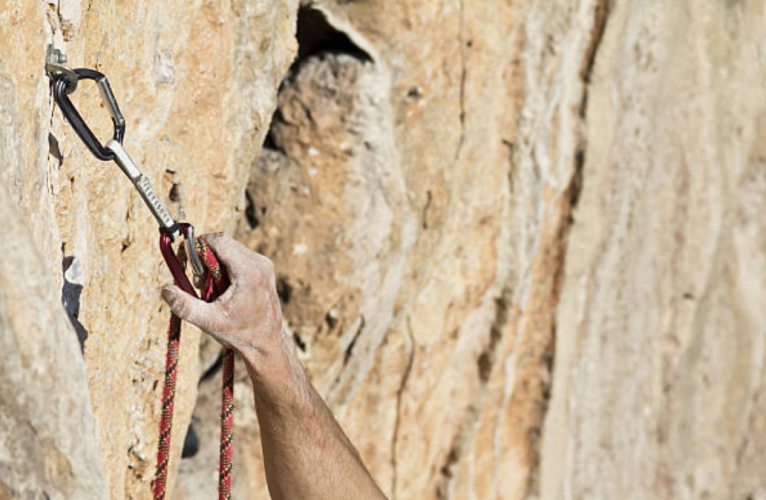 Lead climbing is done both indoors and outdoors. When lead climbing outdoors on a route where there are no permanent bolts, it is called Trad Climbing. Lead climbing is done where there is no easy way to get to the top of the route to set an anchor. It is a lot more challenging than top-roping. 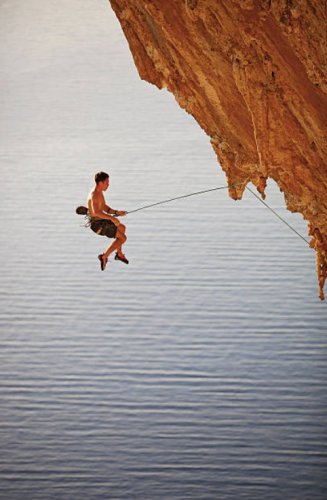 Before learning to lead climb, most people are already familiar with top-rope climbing. 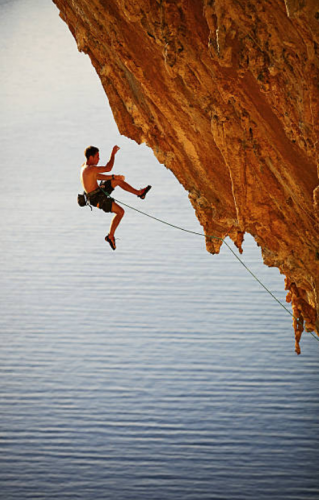 In top-rope climbing, there is already an anchor at the top, with a rope coming down. 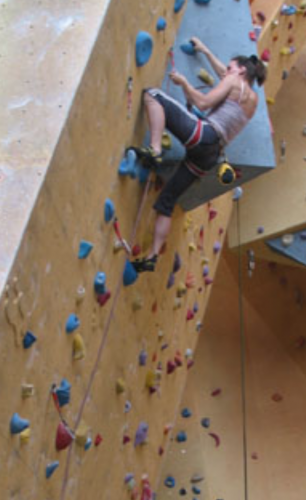 In lead climbing, you take the rope up with you as you climb, clipping it in to the wall as you go. You may not think that it is much more physically demanding than top-rope, but it is. The added work of making sure you are able to stop in the middle of a route to successfully clip in, takes a great deal more experience, endurance, strength, and technical knowledge. 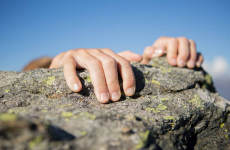 There are a lot of new skills to learn to start lead climbing. Lead climbing will introduce you to new gear, belaying differently, technique involved in how to clip and manage the rope safely as you climb, and even learning how to fall safely. If you are climbing in a gym, you are going to need your own rope and belay device, with a carabiner to attach it to your harness. 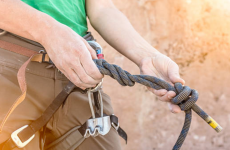 You’ll need to learn how to load the rope into your belay device, and you should be an expert at tying your own figure-8 knot. If you are climbing outdoors, there is a lot of other gear you can use. In addition to a helmet for your own safety, you will also need multiple pieces of equipment like quickdraws to carry with you on your harness and clip in to the bolts as you climb up the wall. 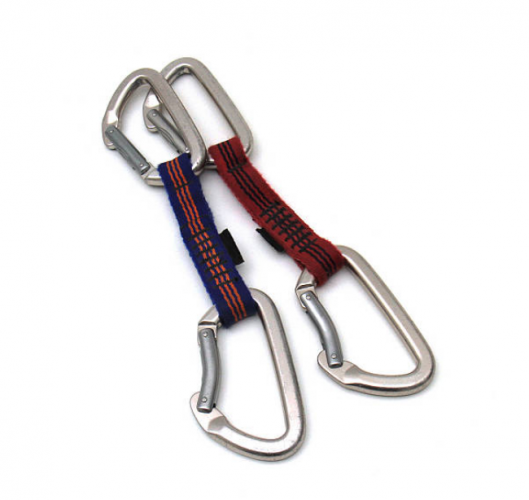 A quickdraw is a set of two carabiners that are connected with a rigid band. One end of the quickdraw will clip into the bolt on the wall, and you clip your rope into the other end. Learning how to belay for a lead climber is very different from learning to belay for top-rope. When belaying for lead climbing, the rope starts on the ground and you are feeding it through the belay device to the climber as they climb. This is different from top-rope belaying, where you are pulling the rope in from the climber as they climb. 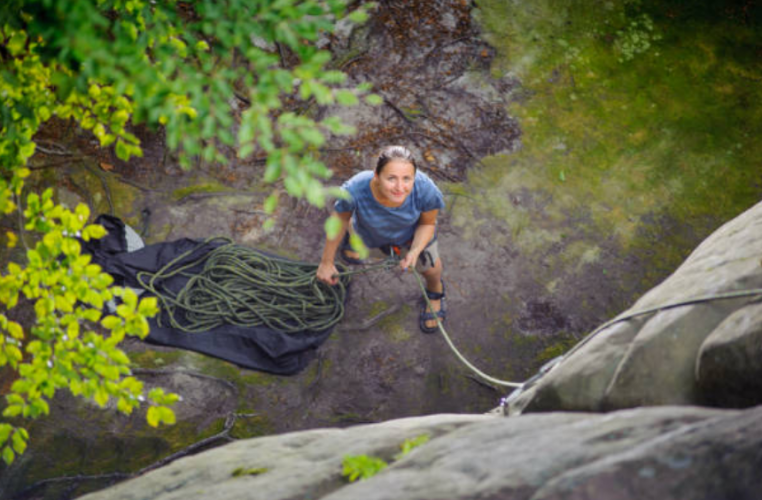 There are some similarities between belaying for top-rope and belaying for lead, such as listening for your climber to call for you to “Take” the slack out of the rope. Lowering from the anchors is the same. There is a lot more that is involved though in belaying for lead climbing, and it requires a lot more attention and focus on the climber so that you can be ready if they are going to take a fall. Learning how to remove the quickdraws from your harness, clip into the wall, and how to clip your rope in will eventually become easier the more you practice it. In a climbing gym, the draws are normally left on the wall, so you can start by learning all that is involved in clipping your rope in as you climb. Taking a lead climbing course at a climbing gym will teach you how to hold the carabiner to clip, how to pay attention to the direction to face the carabiner when you clip, and how to manage the rope so that you don’t get caught behind it if you take a fall. Falling while lead climbing feels a lot different than falling on a rope anchored at the top. If you fall from above a clip, you will fall much further than you would expect if you’re used to falling on top-rope. You will fall at least twice as far as the distance from the last spot you clipped in. The fall will be even further if there is more slack in the rope as well. When starting from the ground, it is especially important not to fall until you’ve reached a height where the drop distance won’t cause you to “deck” (hit the ground). No guide can replace an actual course in lead climbing that you can sign up for at your local climbing gym, or with many outdoor climbing guides. This guide is only intended to teach you the basics so that you will know what you are going to be learning before experiencing the real thing. We highly recommend taking a course to learn and practice lead climbing techniques.